Bharati had a number of friends in Pondicherry. They admired him and helped him. There were some whose company simply delighted the poet. A few helped him at difficult times, providing support, and a few others made important contributions to the growth of his personality. There can be no doubt that the realisation of the self came to Bharati through his many relationships with friends, disciples, and relatives. At the same time, Bharati’s influence on those around him was profound, and the force of his writing and personality helped to unleash a Renaissance in Tamil literature. Bharati belongs to the category of Renaissance thinkers and poets, a special group of great individuals who are products of unique historical forces that appear rarely in civilizations. In Bharati’s case, the tremendous call of the National Movement and the fight for Indian independence catalyzed his growth, and transformed him into one of these leaders of human thought. Some of his friends became characters in Bharati’s writings. He gave them nick-names, which were partly truthful and partly humorous. Vilakkennai Chettiar (Sabapati Chettiar), the owner of the house where Bharati lived was a loving, compassionate man; smooth as castor oil (“vilakkennai”), he would never ask Bharati for payment of the rent. He would drop by with the intention of collecting it, but he was satisfied to listen to Bharati singing a song and invariably left without asking for money. There were “Vellachu” (jaggery piece) Krishnasamy Chettiar, “Elikkunju” (mouse) Arumugam Chettiar, “Valluru” (kite) Naicker, “Brahmaraya Iyer (Professor Subramania Iyer) to mention a few. Among his close friends, Bharati was fortunate to count Sri Aurobindo, with whom he conducted research on the Vedas. Bharati enjoyed the company of V.V.S. Iyer, a great critic and writer; of the siddhas who lived in Pondicherry, such as Kullachami and Govindasamy, the Swamy from Jaffna; of his own disciples, such as Kanaga Subburathinam (Bharati dasan), Va. Ra. (Va. Ramasamy Iyengar,) Kuvalai Kannan; and a great many other, loyal friends. In the picture above, I am seated across from Bharati dasan. Also present were my aunt, Shakuntala Bharati, Bharati’s younger daughter, R.A. Padmanabhan, and Bharati’s disciple, Kanakalingam. Venu Naicker (kottadi vathiar), a disciple and friend of Bharati, was getting married, and Bharati was invited to the wedding. A musical performance had been arranged for 3 o’clock in the afternoon at the wedding reception. About 30 people, friends and relatives of Venu Naicker, were gathered under the canopy (pandal) at the reception. Subburthinam, who later came to be known as Bharati dasan, had agreed to sing. Subburathinam was sitting in the front row, and he turned around to look at the people at the gathering. There were a few familiar faces, and among them he recognized a man that he had seen before, somewhere in Pondicherry. The person he saw was very attractive, with a fair complexion, beautiful and majestic features, and eyes of great depth that seemed to be filled with love – an appearance that was so divine, he looked like a painting! Indeed, Subburathinam thought to himself that the person was the very picture of Paramasivam (Lord Shiva) as painted by the celebrated artist, Ravivarma. The performance started and Subburathinam began to sing: Vira Suthandiram, and the audience was listening with great enjoyment. When he finished the song, Venu Naicker asked him to sing a few more songs. When Subburathinam started again with Thonru nigazhnda danaithum, many members of the audience began to turn their heads to look at the Ravivarma Paramasivam, who was present there. Subburathinam’s face turned pale, and, as the Tamil expression goes, became exactly like the face of “a monkey who has eaten ginger.” He was overwhelmed by shame, fear, and happiness. Everything became a blur. Subburathinam was excited by this invitation and filled with overpowering joy. The relationship that began thus developed into the most important relationship of Subburathinam’s life. Subburathinam was fascinated by Bharati and became an ardent follower. His decision to change his name to “Bharati dasan” signified his affection for Bharati as a person and poet. Subburathinam became immersed in Bharati’s poetry, and involved in his life. The members of Bharati’s family came to see him as one of their own. 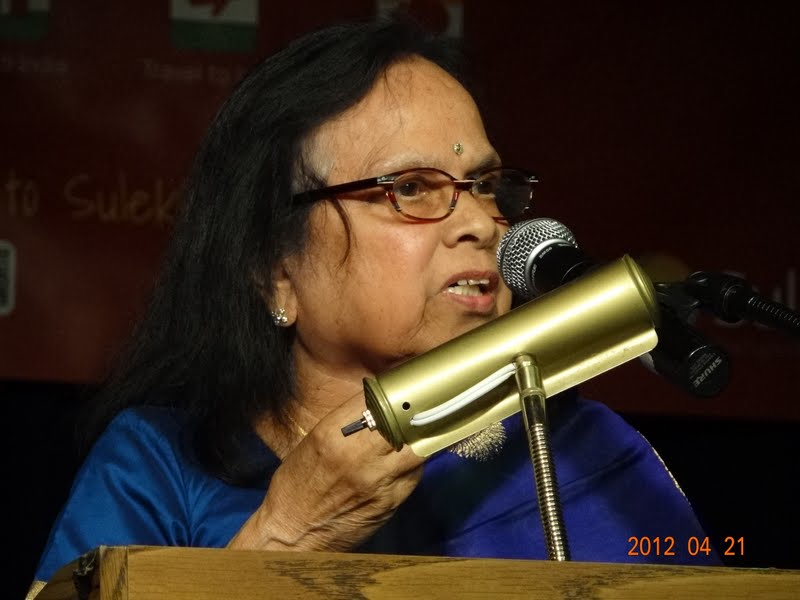 Thangammal, Bharati’s elder daughter, remembers a poem that Bharati dasan wrote early in his career, which she published among her own writings. This poem , which remained unpublished in Bharati dasan’s collections of poetry shows that, in his early years, Bharati dasan was totally absorbed in Bharati’s poetry. He believed in Bharati’s way of life, his revolutionary ideals, and his principles. Bharati dasan considered Bharati his guru, and respected him enormously, not only for his poetry, but also, as an exceptional person. You can read this poem by clicking here. It shows how passionate was Bharati dasan’s love of his country, as well as his belief in appealing to Parashakti. The influence of Bharati is apparent in the style of writing, in the words that Bharati dasan used, and in the nationalistic fervour and emotional heights that the poem reaches – undoubtedly inspired by Bharati. In fact, the foundation for Bharati dasan’s entire development was laid by his association with Bharati. Bharati was a passionate believer in equality, and constantly argued for justice on behalf of the disempowered groups in Indian society – notably, women and the disadvantaged castes, as well as for the equality of Indians with other citizens of the world. Bharati dasan was originally involved in the Indian Independence Movement, opposing the British and French governments in India, and consigned to time in prison by the French government, for his pro-Freedom views. He later became involved in post-Independence revolutionary movements, joining the Dravidar Kazhagam, founded by Periyar E.V. Ramaswamy, whose original goal was to eradicate the evils of the caste system. The ideas behind the movement were equality and self-respect, ideals that Bharati stood for throughout all his life and writings. Bharati was a Universal poet, in the sense that his poetry encompassed everything in nature. He wrote about the animate and inanimate objects of the universe – the sun, the moon and the stars – the sky, the wind, the fire, the earth and the waters – the mountains, the rivers, are all part of his life. He had a deep relationship with all the objects of creation. Because of this, his poetry belonged to all three times, the past, the present, and the future. His poetry was preoccupied with truth, in a cosmic sense, which is the essence of life. As illustrated by Bharati, the characteristics of a Universal mind, I think, are faith in God ,who created the universe, and Love, by which the Universe functions. Bharati was a Renaissance poet who revived our culture, and shaped and styled the Tamil language and literature. Like Shakespeare, there was no subject matter that he left untouched, or failed to deal with in his writings. Bharati was a Revolutionary whose goal was to completely remodel society, and give it new lustre. Through the power of his creative imagination and insight, he was able to uproot the age-long ideas and thinking of society and completely change the direction of its future. Over time, society at large was influenced by this great personality. Bharati dasan’s literary works have earned a place in the canon of Tamil literature alongside Bharati. He wrote on various themes – from political and social, to purely literary, and on the Tamil language. He wrote plays, short stories, essays, and film scripts. My personal recollections of Bharati dasan remain among my most treasured memories. In fact, I was first introduced to Bharati dasan as a teenager, by my aunt, Shakuntala. She took me with her to Pondicherry to attend a Bharati vizha (celebration), organized by Bharati dasan. I can’t exactly remember the year now. On the day preceding the celebration, I met the poet. At that time, I had already read and enjoyed Bharati dasan’s poetry before and used to sing a few of his poems at home. When we met, I sat down respectfully in front of the poet, and suddenly he asked me to sing a song. I started singing Bharati dasan’s song Thunbam nergaiyil, which had been beautifully sung in a movie. Bharati dasan was deeply affected. He then asked me to sing a Bharati song, which I did – the poem starting vendumadi eppodhum viduthalai. The following day, at the grand vizha, hundreds, perhaps thousands, of people were gathered. The poet asked me to sing Thunbam nergaiyil as the first order of business, to inaugurate the event. I was deeply touched by the love he showed towards myself, and towards my aunt Shakuntala, as the members of Bharati’s family. Talking about Love, I have a firm belief that Love is, in fact, the underlying quality of a poetic personality and without love, poetry cannot be created. This, I arrived at, after studying Bharati a lot, and reading some major poetry in English literature under the guidance of my late husband (a professor of English). An Atheist does not believe in the existence of God. On the other hand, Bharati was an impassioned devotee of Parashakthi. From what I have read in Bharati, I understand that a person who has faith in God believes in his Creation, and Love is the essence and theme that unites all of God’s Creation. Any expression of hatred towards other human beings cannot be part of the flow of Creation, or meaningful to life. I expressed my theory earlier about Love as the underlying quality of a poetic personality, and without love, poetry cannot be created. I have no question in my mind about the validity of my conviction. Bharati dasan was a believer in goodness as opposed to evil, a supporter of justice as opposed to injustice, and undoubtedly a worshipper of Love – a divine quality that permeated his heart and soul. Perhaps, he denied “God” as expressed in religion, an imagined figure and form. Regardless of whatever “label’ he applied to himself, the fact that he believed in goodness, justice, and love makes him easily recognizable, just like his guru, as a devotee of truth.